NEW YORK - "I'm angrier than ever," said filmmaker Michael Moore. But in his hilarious new documentary, "Where to Invade Next," he suggests he's working "in a more subversive way to deal with that anger about the condition of this country. "I talk politically a lot, but if I really wanted just to make political speeches, I'd run for office." Instead, he makes movies. Moore's documentaries, which blend humor and pop culture references with pointed political jabs, include "Roger & Me," "Fahrenheit 9/11" and "Sicko." He won an Academy Award for the 2002 "Bowling for Columbine," which addressed a culture of gun violence, mass shootings, and the National Rifle Association. During a press conference Friday at the New York Film Festival, Moore commented on Thursday's mass murder at Umpqua Community College in Roseburg, Oregon, in which 10 people died, and of Congressional resistance to stricter gun laws. "Yesterday was like, what was the point of making ['Bowling for Columbine']? Here we are, 13 years later. [But] that's not a rabbit hole to go down. "I am an optimist; I'm not a cynic. I don't think it's all f----d. I feel like that at times, like yesterday's shooting. What do we DO about that?" "Things can change and will change. I said after Newtown -- I didn't say this glibly and it's upsetting to think about -- if they actually showed the crime scene photos of 20 first-graders with their heads blown off, how long would the NRA stay in power? And of course I don't want them to do that, it's an awful thing for the parents to hear something like that. "But a month ago, a three-, four-year-old child washes ashore on the beach, a refugee, and just instantly [Angela] Merkel and Germany, those countries, Austria, let them in, 400,000. 'Come to Germany!' It moved the German people, it moved people -- a photograph of that child that was so, so upsetting. Sometimes these images, and what we [filmmakers] do, does matter and can affect change. "It doesn't take a lot; just a few people have got to do something, not a lot of people. No change has ever occurred with the masses doing it. Fewer than 25 percent supported the American Revolution in the Colonies, right? Jesus has 12 guys that fished!" Regarding President Obama's statement at the White House on the Oregon school shooting ("We've become numb to this ... It cannot be this easy for somebody who wants to inflict harm on other people to get his or her hands on a gun"), Moore said, "He inches his way toward that place where he needs to go. And I hope he goes there; he's got a year left." Moore remarked that in this country, "You have a right to regulate a woman's uterus, but not guns? I think the only safe place for guns would be IN a women's uterus -- then they would be regulated by our Republican Congress! ... I hope that came out right!" 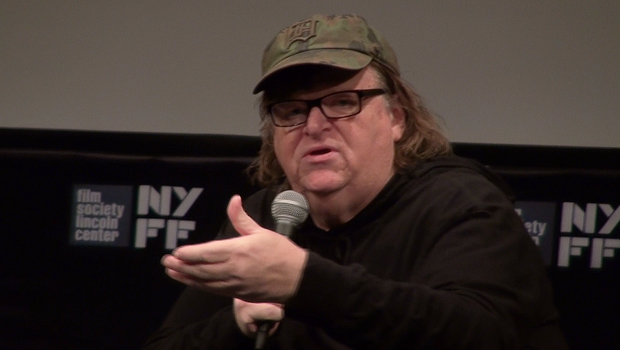 In his latest film (which had its U.S. premiere tonight at the New York Film Festival), Moore travels around the world, "invading" countries to learn about and steal their bright ideas that would make America an even greater place. Free university education, with no student debt? Thanks, Slovenia! Eight weeks of paid vacation, PLUS three weeks paid honeymoon, PLUS national holidays? Way to go, Italy! Treatment and not prison for drug users? You got it, Portugal! The inspiration for the film came as early as a college-age trip through Europe, when Moore broke his toe in Sweden. He received medical treatment, and wasn't asked for money. "There was no bill, and I didn't understand it," he said at a press conference in New York City on Friday. "All through Europe I just kept running into things like that thinking, 'That's such a good idea! Why don't WE do that?'" The film explores areas where other countries are rated higher than the U.S., and tries to uncover the policies and social mores that may account for that. In Finland, ranked #1 in education, students have no homework and no standardized tests. In France, rather than scarf down hamburgers and French fries in 20 minutes, school kids actually have a lunch hour during which they eat fine foods prepared by chefs, with not a vending machine in sight. Students also learn about nutrition and how to serve meals. Moore admits that he went to "pick flowers, not weeds," and acknowledges that every country has its problems, some of which are addressed in the movie. But the film makes cogent points about the value that different societies place on the dignity of their citizens, and in his view, America sometimes comes up short -- from the treatment of prison inmates and ex-cons to toddlers being patted down by TSA agents. Germany is held up as an example of a culture that actively addresses its past national sins of racial hatred and the Holocaust -- an atonement that Moore says the U.S. should emulate for its history of genocide and slavery. Moore says he is often told, "That won't work in America," and has grown tired of hearing it. He doesn't believe it's true. "I mean, lots of things have to happen, obviously -- an anti apartheid movement starts, people start divesting from South Africa, there's a multi-decade campaign, and then one day it tips. And one day one man who is the president of South Africa has to wake up and say, 'Let him out.' Ultimately sometimes it's something like that, or sometimes it just a bunch of people that show up and start chiseling on the [Berlin] Wall." Moore noted that until very recently, "Forty-one states put it into their constitution or laws that it was illegal to marry people of the same gender. And then it tips. It tips because people do things, and those who are so-called in charge get out of the way. They know when to get out of the way, usually. Sometimes they don't, and a larger rebellion takes place." "Where to Invade Next" has not been rated. 110 mins. A newly-formed distribution firm, founded by former executives of Radius joining with Alamo Drafthouse, will release the movie, date TBA.